View the threads ApopkaJohn has started. Leave feedback for ApopkaJohn or read feedback left by other members. View the member feedback ApopkaJohn has written of others. "Amateur propagator and collector of wild and subtropical "survivor" plants. Half acre lot near Orlando central Florida. 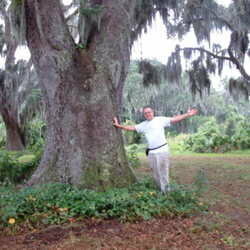 Only a few Frosty days with minimum air temp down to 24 F."
"John poses with Grandfather Oak tree"